DesktopOK v4.02 >Save and Restore Positions of Icons. Update of the language files and small adjustments in DesktopOK. Again customizations and improvement in DesktopOK when customize the DPI values! Verification and testing of DesktopOK on Windows 10 Technical Preview. Adjustments and improvements in DesktopOK, when customize the DPI values in the system display settings! Bug-Fix in the option, window, to tray via right click on the close button. New function: temporarily disable Aero via tools, system! Some Corrections in DesktopOK for x64 and updating of the language files. Update of the language files in DesktopOK. 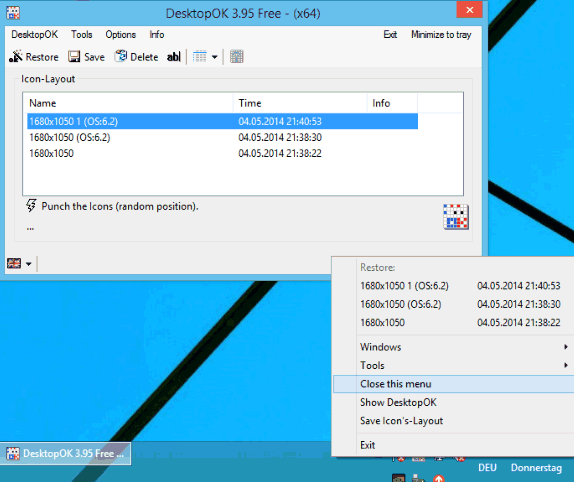 Improvements and adjustments for the Windows 8.1 and update of the language files in DesktopOK! Correctionsin the Alt-drag function when mover or change the size of the window (Windows). Improvements in the option, window, to tray via right click on the close button. Improvements in DesktopOK main menu bar. Bug-Fix in the DesktopOK List--View! Note: Even if picture is from an older version, once downloaded you will see that app version is 4.02 (or newer, because they update the links below). Re: DesktopOK v4.02 >Save and Restore Positions of Icons.